(0 Customer Reviews) | Write Review 4 issues per year DOGS Life is the magazine for the growing mass market of responsible dog owners who want to enjoy life with, and take good care of, their dog. Published bi-monthly, DOGS Life is targeted at both owners of pure and cross-breeds. Our readers are serious about being responsible dog owners and want to be informed on good health, training, and caring for their pets. DOGS Life offers informative stories on a range of subjects, from hard-hitting topics to heartfelt stories, healthcare, behavioural issues and more. DOGS Life is a magazine the whole family can enjoy and includes an interactive Kids Club section, regular news, breed features and hot products. DOGS Life articles are comprehensively researched and written by experts in the industry. DOGS Life provides valuable and practical information in a superb-quality, environment. Dogs Life is designed for highly-engaged dog owners who want to be informed on good health, training, and caring for their dog. Dogs Life readers are out there walking, playing and caring for their dogs and are doing so with pride. 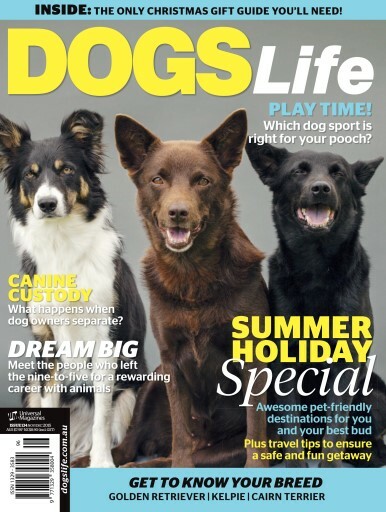 Dogs Life offers informative stories on a range of subjects, from hard-hitting topics to heartfelt stories, news, nutrition, healthcare, behavioural issues, training and breed features. Dogs Life articles are comprehensively researched and written by experts such as veterinarians, breeders and behaviourists in the industry who provide valuable and practical information. DOGS Life is the magazine for the growing mass market of responsible dog owners who want to enjoy life with, and take good care of, their dog. Published bi-monthly, DOGS Life is targeted at both owners of pure and cross-breeds. Our readers are serious about being responsible dog owners and want to be informed on good health, training, and caring for their pets. You'll receive 4 issues during a 1 year Dogs Life magazine subscription. You'll receive 4 issues during a 1 year Dogs Life magazine print subscription.